Judged across the entire 30 year span of Grateful Dead music, 1973 and 1974 possess tremendous similarities. However, when viewed in detail they reveal stark differences at many levels. The explorative playing style in 1974 has an aggressive and intentional bent. The band was pushing in ‘74, whereas in 1973 things seemed more about open discovery. By 1974 the discoveries of ‘73 were well catalogued, and the band spent that majority of '74 working these discoveries to their bidding. The entire 1974 opus displays this tendency, but the Santa Barbara show on May 25th seems to do so in extreme fashion. 5/25/74 sounds nearly nothing like 1973. It is a show full of an almost hell-bent intensity which pervades the entire performance. We are treated to both a fine soundboard and an audience recording of this sweet show. Being at an outdoor venue in midday, one can't help but appreciate, yet again, the glory of the Wall of Sound being preserved on tape in the open air. The audience tape, recorded by Jeremy Witt, pulses with a thick and almost suffocating electricity that only 1974 could produce. It is not to be missed. I'm not keeping tabs on such a thing, but the Scarlet Begonias here on 5/25 may be the fastest one on record. The song's syncopated rhythms stand out like spikes. Scarlet churns like a great ball of fire, packed with the energy of swirling suns and titanic plumes of lightning. In whiplash fashion, the band flies through the song's verses, leading to some Donna wailing that eclipses anything you may have heard in another show. She truly outdoes herself -- the energy of the song possessing her in a way that I've not heard before or after (and I've heard my fair share of Donna wails). It's brief, but she seems catapulted into the air by the rushing music. 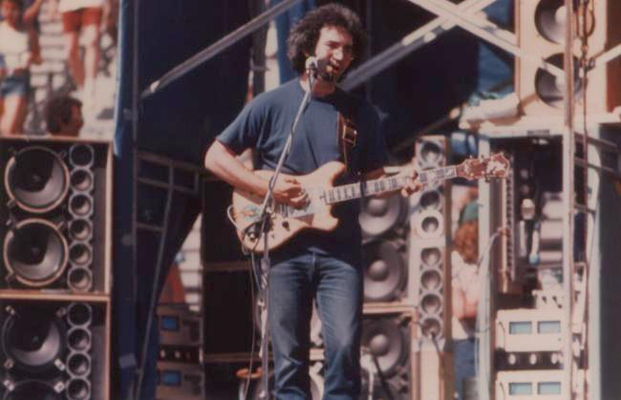 Jerry follows this up with a rapid solo which rounds into the end of the song so quickly it will make your head spin. But this barely hints at the intensity found in the China>Rider later in the set. Searing, devastating, nearly brutal in tempo, this China Cat jam will evaporate the air in your lungs. The Dead explode through the descending four chord block section and whirl into I Know You Rider amidst a blaze of glory. Phil is causing continental shifts while Garcia's guitar strings become comets burrowing into the atmosphere, their trailing tails crackling with strobe light sparklers. We reach the end of the song as if it was speeding by like a rocketing freight train. It slams to a stop leaving our eyes as wide open as the horizon.The music is taking no prisoners today. You won't find too many mentions of the tune Around & Around on these pages, but as if to outdo the entire first set leading up to it, this version steps in and demolishes everything for miles around. Rock-n-Rock all the way. Whoa. They need to stop here just to let the Wall cool down a little. The May 1974 run is punctuated with four fantastic Truckin's over six shows.Number one can be visited on 5/12/74. Here on the closing day of the run, with the full head of steam this sweltering show has been building already, we launch into another epic rendition. Out of the final verse great torrents of molten lava and serpent tongue licking fire flood every pore. Melting wagon wheels of imploding light fuse all senses into one avalanche of power. Slowly, the band lets the crushing energy of the music give way to a more liquid and loping landscape. Garcia eases into great rich bell tones and the music slips into the air as if turned into ten thousand multi-hued feathers. The air becomes filled with music streaming and trailing in all directions. Eventually, the ironclad connectivity of sound is broken and the music forms undulating mountains spread across a valley stretching into the distance. Coils and tendrils seethe underfoot coming to grip the terrain more and more tightly. Wind shifts and Let It Grow shimmers into view. Let It Grow, as one might expect, takes off like a rocket ship. Played as fast as any version I can recall, the surging music allows Garcia to reach speeding staccato notes in his solo while also giving way to great swooning shooting stars. 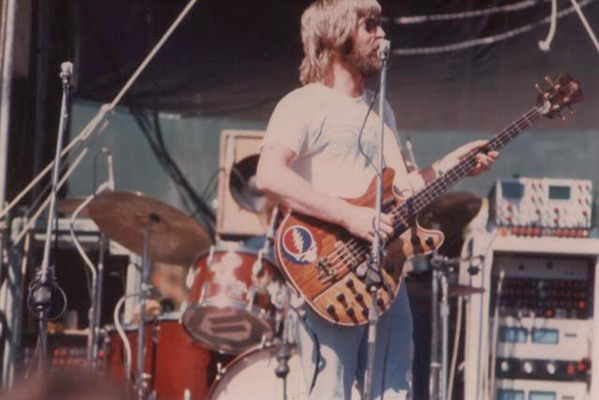 This Let It Grow jamming distinguishes much of the 1974 playing style and stands in direct contrast to 1973. Things just didn't move this fast in that earlier year. Let It Grow tips over the edge of the world into vast clouds, cascading sublimely into Wharf Rat. The song goes on to brew a deeply entwined tapestry of sound-colors. It latches itself to the pulse of our breathing; the marrow in our bones is awash with the touch of this timeless rhythm. The veil of reality dissolves into infinite details, strumming an ancient and haunting song of the soul. Music becomes water and wind finding its way into every crevice; filling every vessel. 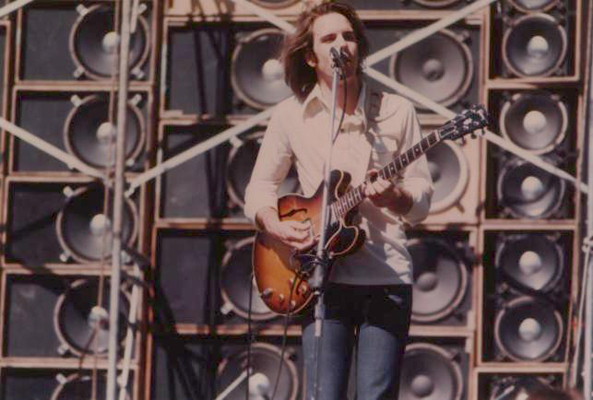 Here, again, is the forever beating heart of the Grateful Dead. With no effort, we merge into that which can only be described as something we've always known to be ourselves. By the time the band pulls out Going Down The Road Feeling Bad, we are back in the direct path of the scorching sun. Billy's drumming dances like a symphony of rainbow refractions out of a crystal seascape. He appears to be coming from every possible direction. Jerry lets fly one fiery solo after another, eventually riding that familiar geyser of swirling light into the sky, illuminating the clouds from within. The show seems incapable of exhausting its source of power, and drives on through a set closing One More Saturday Night, and a decidedly tasty Casey Jones in encore. Whew! note: All photos were taken on 5/25/74, photographer credit unknown.